A yummy, authentic Italian pasta dish everyone must try! A delicious family recipe brought to us by Lauren at realmomkitchen. In a large stock pot or casserole dish brown beef along with diced onion, julienne carrots, diced celery, and garlic until meat is browned and fully cooked. Drain off any grease. Then add the tomatoes, beans, passata, V8 Original juice, vinegar, salt pepper, oregano, and thyme to the meat. Bring to a boil. Reduce heat and simmer for 1 hour. While the soup simmers, bring another pot of water to a boil and cook pasta according to directions. Drain and add to the soup just before serving. Top each serving with parmesan cheese if desired. 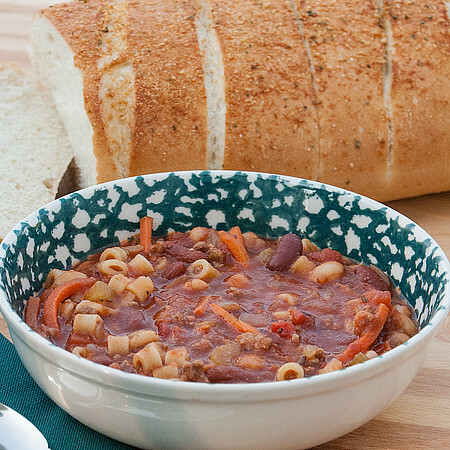 This delicious and exciting family dinner recipe was brought to you by Lauren Powell from realmomkitchen.com. She’s an incredible cook, and this scrumptious dish is proof of that.